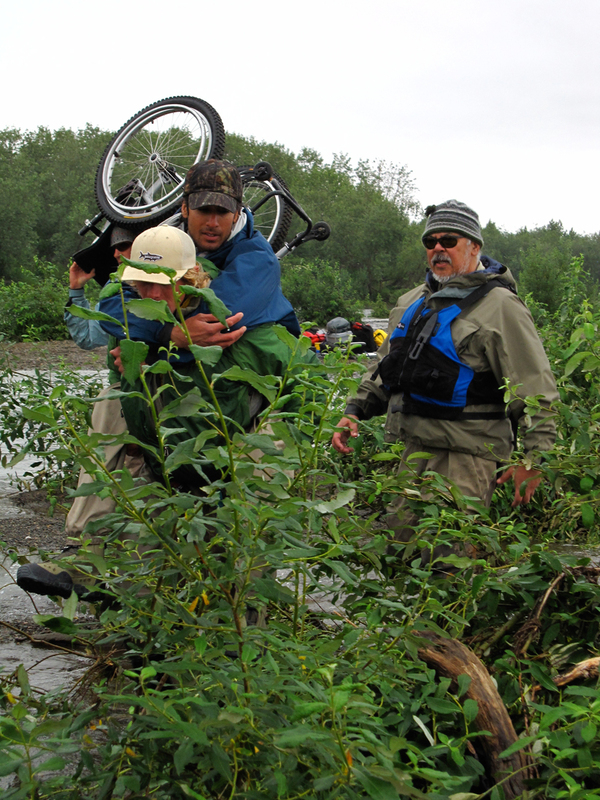 On July 9, 2011 6 participants gathered together in Dillingham, Alaska to launch a fly fishing expedition into the Wilderness of Togiak National Wildlife Refuge. 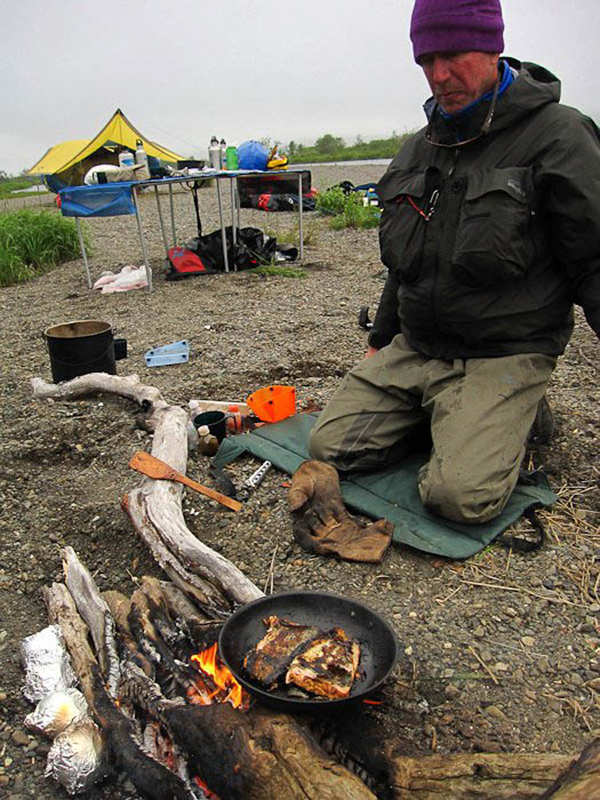 Our goals were much the same as other Alaska wilderness enthusiasts who fly out in small float planes loaded with rafts and camping gear to float and fish wild Alaskan rivers. Our commitment was: “to be prepared mentally, physically, and with proper equipment to be self supporting in the wilderness”. 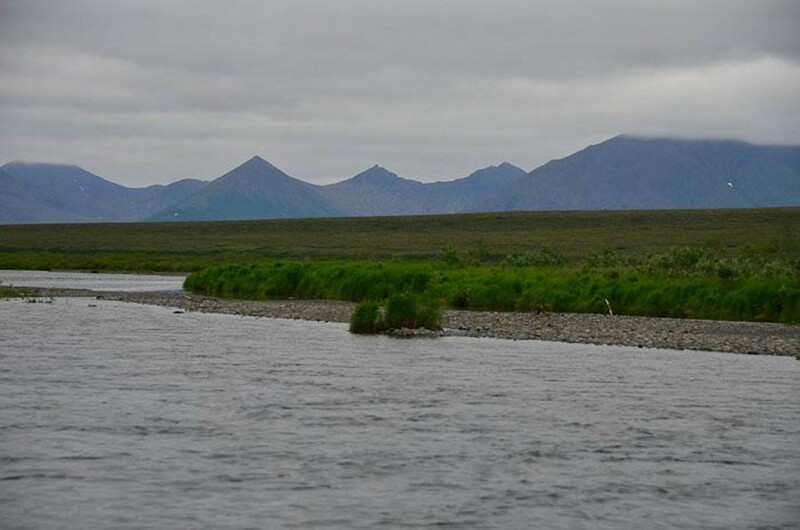 We would be dropped off at a lake beyond the tree line to navigate shallow tundra river channels, to float, fish, and camp among the notable Alaskan Brown Bears of the region. 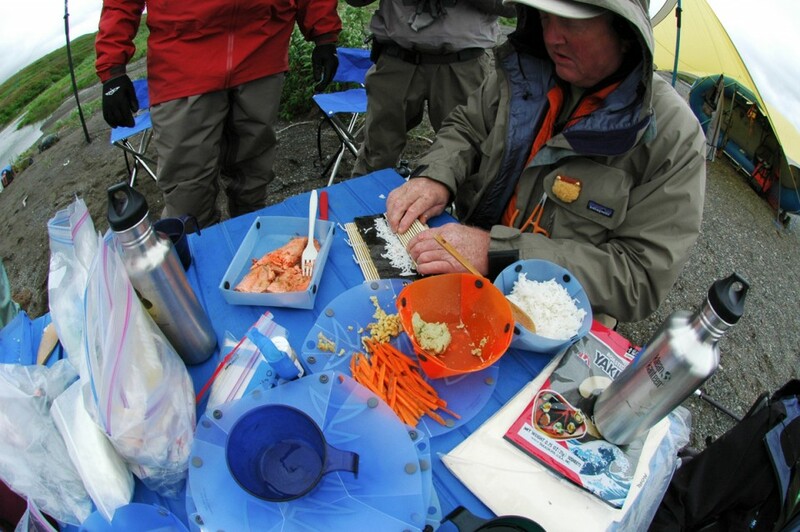 Two of the participants were especially motivated by their commitment to live the Alaska wilderness experience to the fullest! For them as each day passes their physical abilities and health are compromised by MS, Multiple Sclerosis. A third participant with a prosthetic leg, Malcolm Daly, co-lead this annual Paradox Sports trip. Karen Daly and Olly Merrill and I signed on as support. 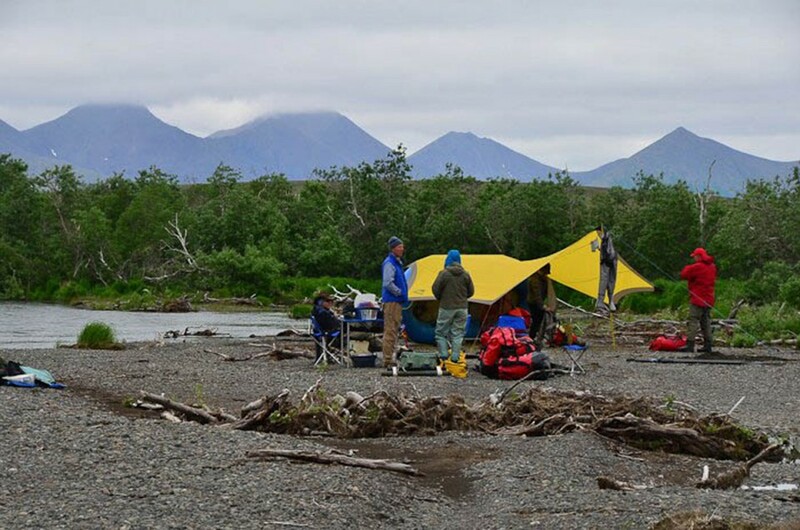 The trip fulfills an ongoing commitment shared by outdoorsmen John Merritt, Malcolm Daly, and Mark Rutherford, to make truly significant, bona fide, Alaskan wilderness expeditions accessible to significantly disabled campers. We believe that if Erik Weihenmayer, totally blind, can summit Mt. Everest and that Mark Wellman, a paraplegic, can climb El Capitan in Yosemite National Park, that others with disabilities will consider taking on expeditionary challenges. In this case to undertake a self propelled adventure across a vast Alaskan landscape. 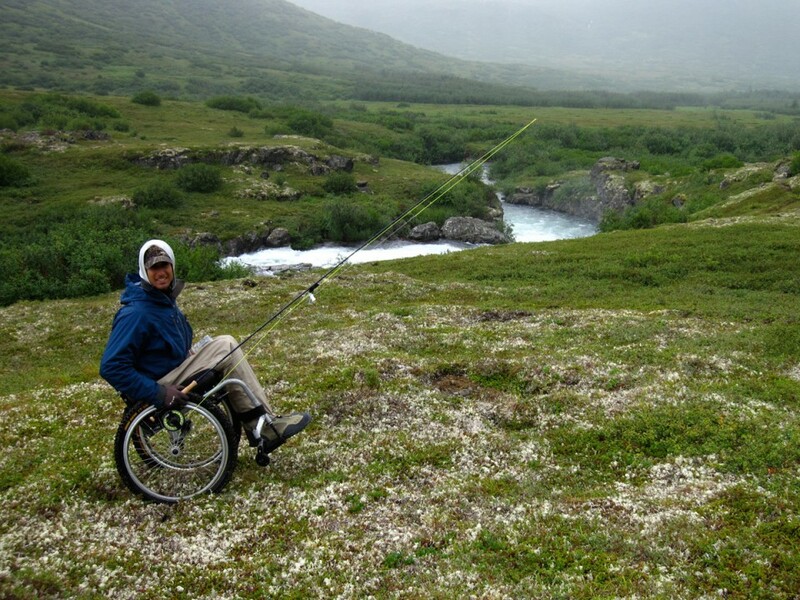 We undertook the first self propelled Alaska expedition with paraplegic fly fisherman Vijay Viswanathon and angler Malcolm Daly with his prosthetic leg, in 2009. 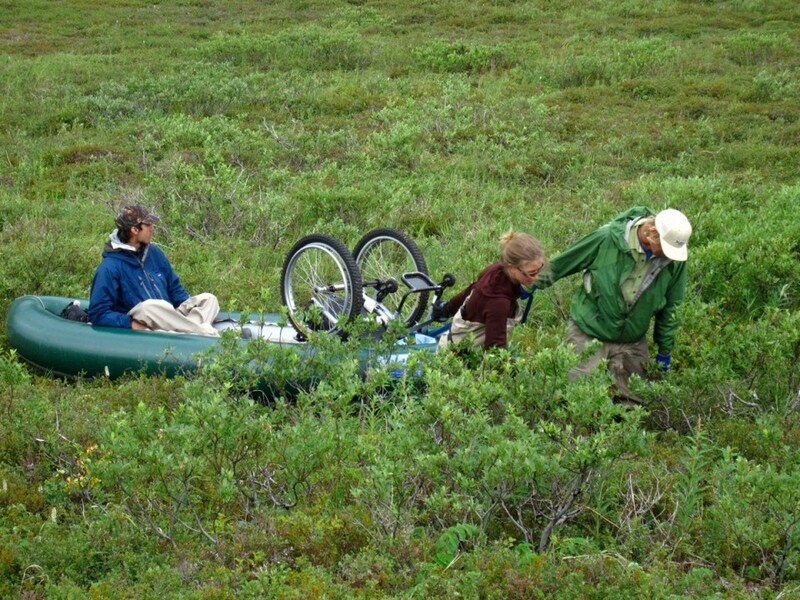 In 2010 we completed a second adventure with 5 disabled participants. 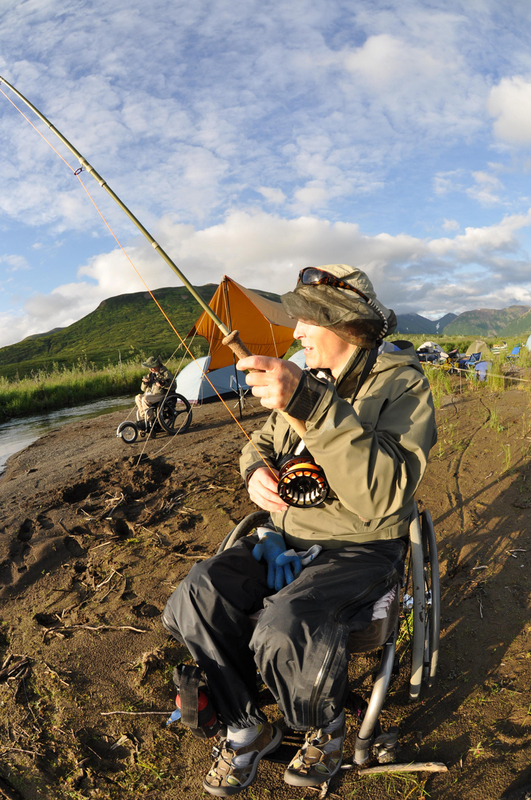 In 2011, to honor John Merritt’s extraordinary vision we devoted the Alaska wilderness fly-fishing expedition to participants with Multiple Sclerosis. 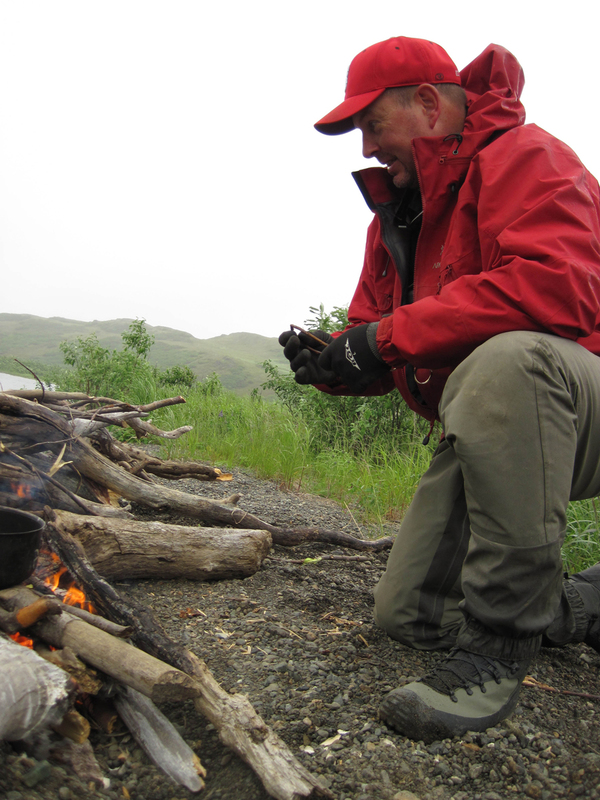 John Merritt has secondary progressive MS and his prior adventures exploring remote Alaskan fisheries are spoken of around many campfires. We launched from Dillingham in Dehavilland Beaver floatplanes in low weather that could hardly be called auspicious. As we flew west through various mountain passes the marine cloud layer pressed down against the tundra ultimately preventing flight toward our goal, a small inaccessible river requiring a portage. 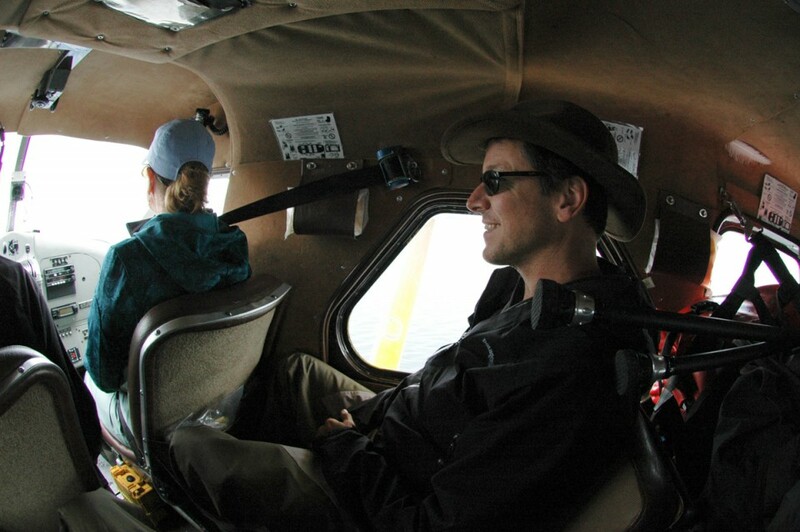 The pilot, Rick Grant turned and asked, “Do you have a plan B?” Our options would be to return to Dillingham and wait, perhaps several days for this storm cycle to pass or alternately to select a different river. 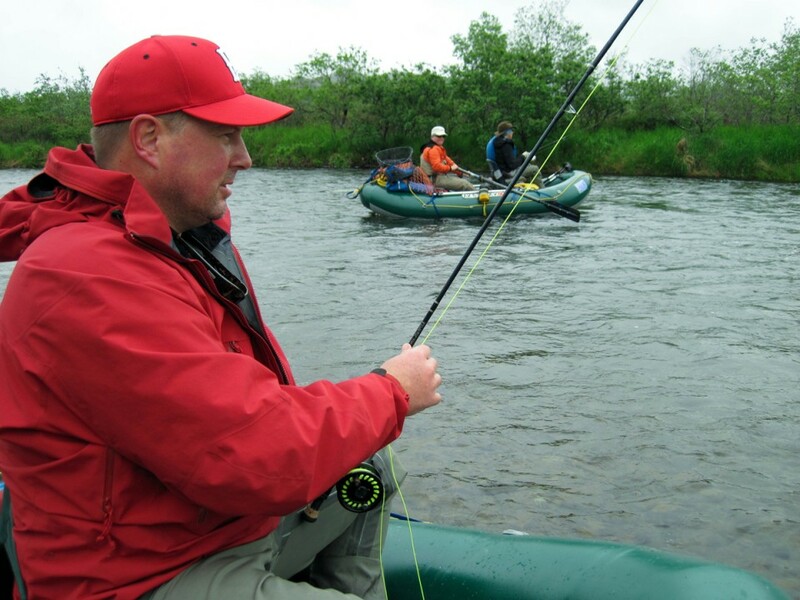 We chose to reroute the expedition and go fishing on the Middle Fork of the Goodnews rather than sit in town waiting on the weather. At a time in his life when many others are mostly confined to a wheel chair Mike Baxter struggles mightily and manages with special trekking poles and an “off road walker” to participate in his adventurous, some might say extreme, outdoors life. 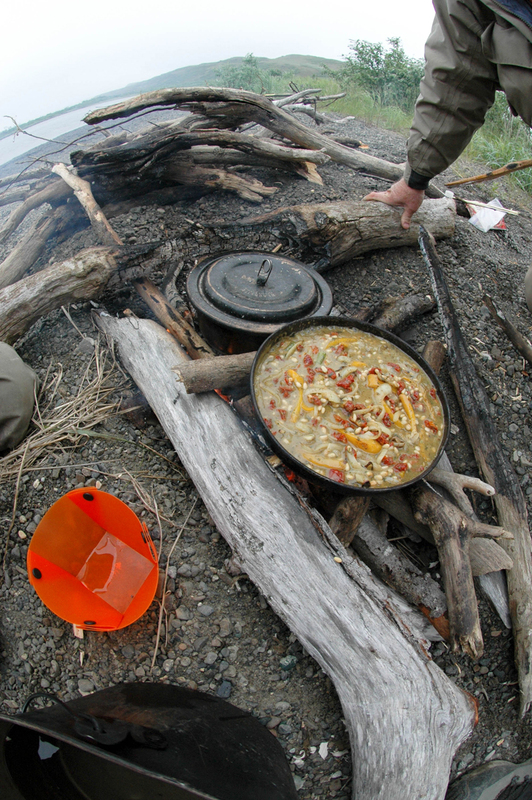 In addition Mike is a chef and what expedition can’t benefit from great cuisine? 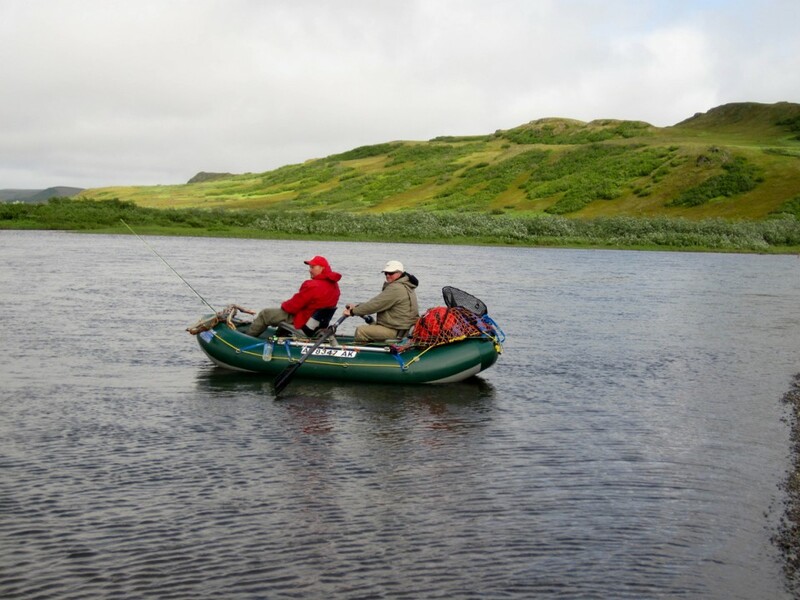 Mike and Keith’s goals would be to learn to fly fish this week in addition to tackling all the travel and camp logistics! 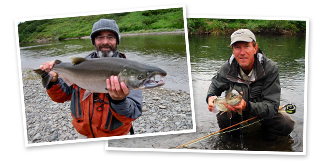 They were both accomplished spin fisherman and eager to take up the fly rod challenge. 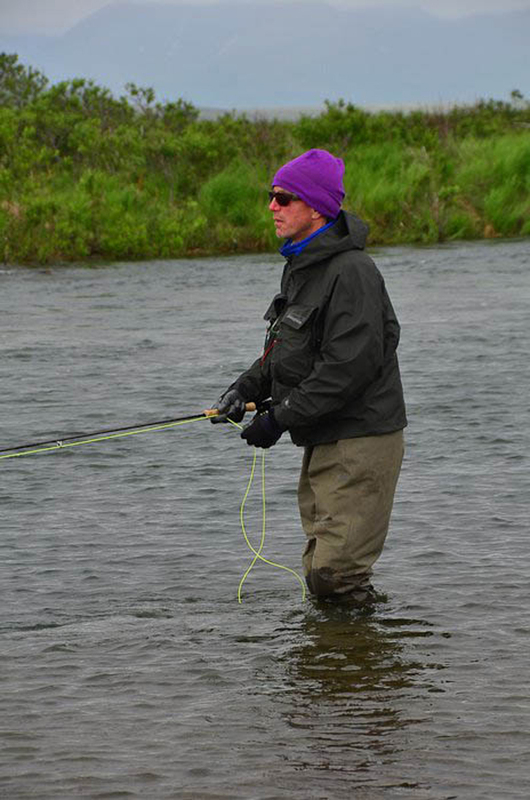 Can you imagine if you caught your first fish on a fly rod on a wild Alaskan river? For the next three days the river would be completely shut off from the world by weather conditions precluding air travel. The barometer fell, then rose, then fell again, the wind blew and weird teardrop shaped lenticular clouds dominated the sky. We had some more sideways rain. But this is the norm for the region. Our first mile rowing through pods of mint bright Sockeye salmon in the mist served to get us focused on the present moment, the “here and now” and to help erase the travel stress of jetports, luggage, delays and jet transfer awkwardness of the preceding days. We shoved off down river to participate in whatever the river offered. The first bear eaten salmon carcass lay on the lush damp trampled grass on the left side of the river. 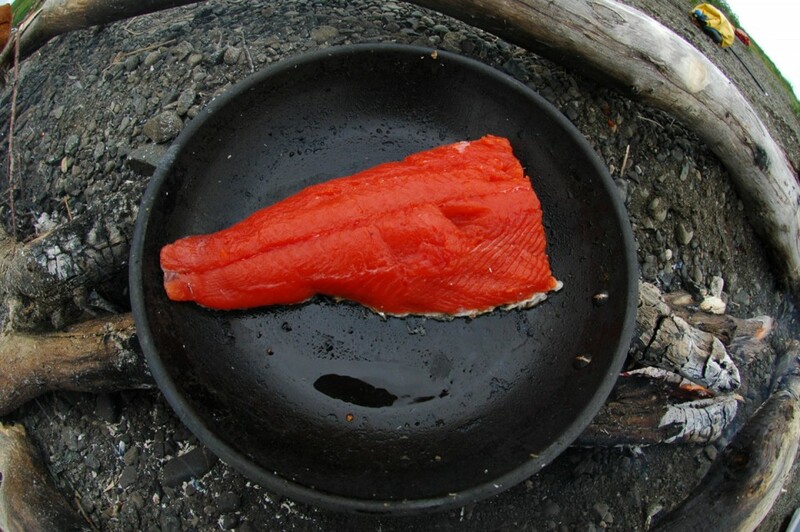 The ruby red Sockeye flesh had just recently been stripped clean from the bones. The large Alaska Brown Bear tracks in the mud were crisply delineated, not rained upon, and just minutes old. We then looked at the shrubby riverside Alder and Willow brush with new interest and nervously began to sign, to chatter, to call out “hey bear” and give Brown Bears every option to anticipate our appearance on what is indisputably their river. 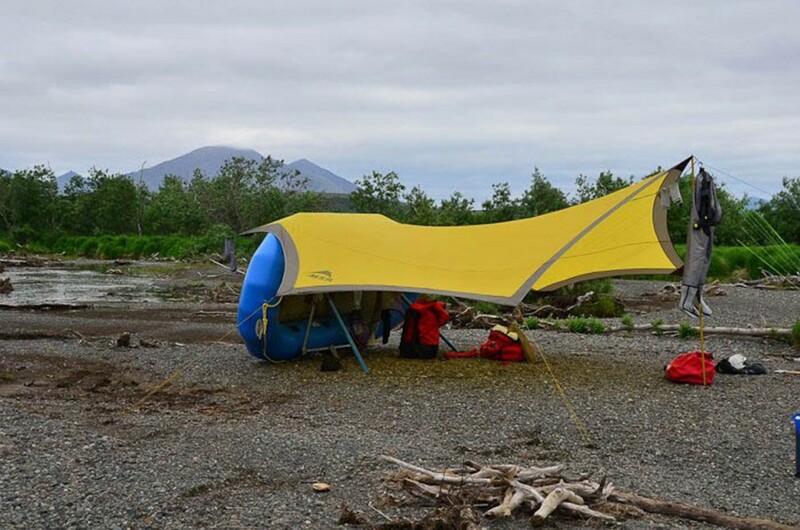 Camp 1 in the rainstorm on a small gravel bar of the Middle Fork of the Goodnews River, Alaska. 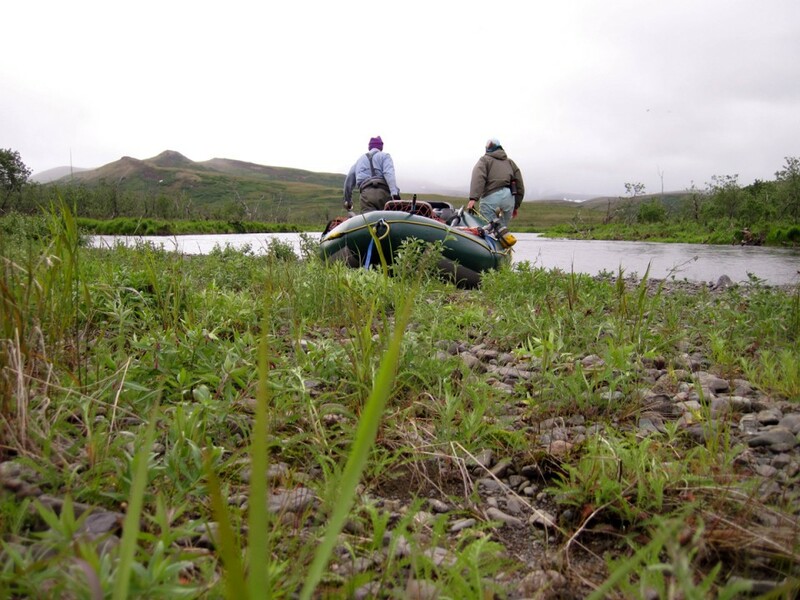 We rowed and dragged three small light rafts loaded with about 800 pounds apiece for seven miles to our first camp. 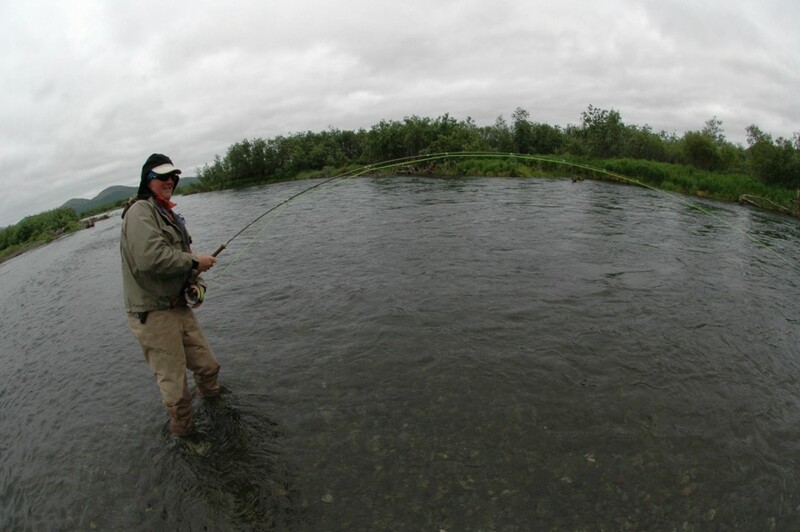 The upper Middle Fork exacted a toll, as wild western Bristol Bay Rivers should. We dragged through shallow water until the river collected sufficient tributaries to carve and maintain a channel. A hydrologist would point out that a vast amount of water flows beneath the gravel of these rivers. Down valley for some miles most of the water flowed underground except when a bedrock canyon forced it to the surface and so we dragged the boats down wide shallow reaches with occasional interludes of rowing. The game plan was for self propelled participants to “nimbly leap” from the bow of the raft into the shallows, grab the lifeline rope and tug rafts across the gravel bars. In truth able bodied participants fairly routinely “face plant” in the river during these maneuvers. After towing raft across the bar one theoretically “hops” back into the raft. Considering prosthetic legged Malcolm and also considering Mike’s legs which are severely compromised by MS it was clear that the nimble leaping would fall disproportionally to some other members especially Keith who is so strong in spite of the MS, and to Karen Daly. This is why we came as a group! What inspires this sort of travel supporting disabled participants? For me who is able bodied, the inspiration stems from when as a lad of 17 years old I stayed in the Yupik Eskimo village of Savoonga, Alaska for 6 weeks. 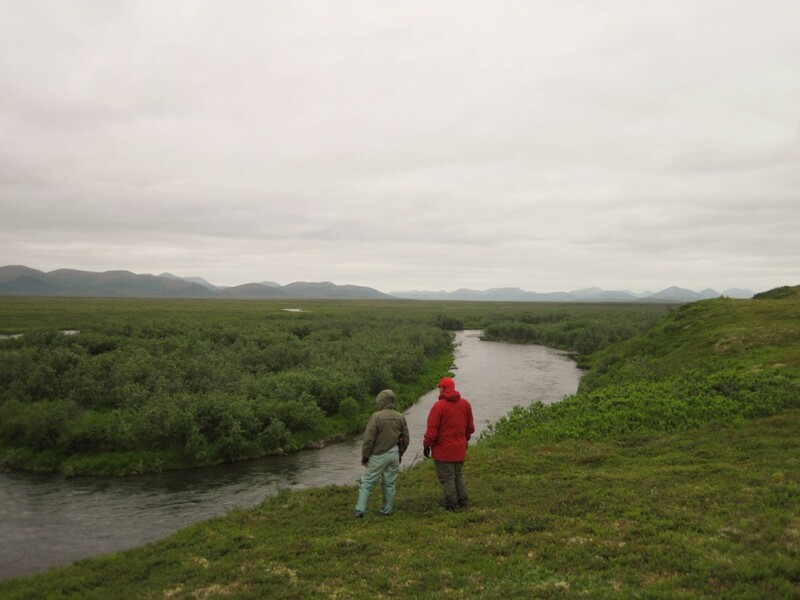 Here surrounded by the Bering Sea were hunters of whale and walrus. Among them were quite a number of disabled villagers who seemed to have important roles in the traditional culture. The disabilities that I was aware of ranged from totally blind, to wheel chair dependant, to neurological impairments, and amputees. Yet with a little community support the disabled hunted and traveled by traditional walrus skin boat (Umiak). They sewed waterproof mukluks from sealskin. 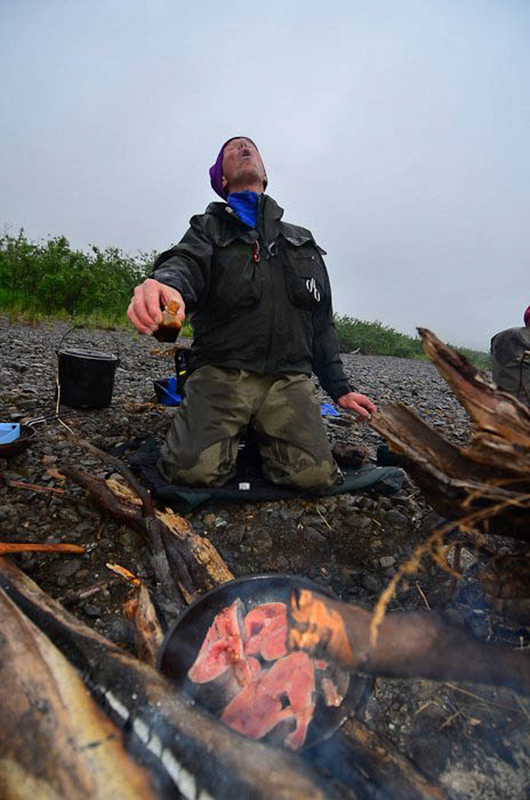 They traveled to seasonal fish camps and they gathered wild plant food. Some carved magnificent ivory art objects. They harvested seals. They cared for children. Some drummed, sang, and danced. Renowned Alaska Native storyteller Sarah Frank also inspires me. Sarah acknowledges her debt to her “great-grandmother (who lived “pre-contact” in the mid nineteenth century in Alaska’s Brooks Range and was) crippled…. She had to be carried on other’s backs, especially in the summer months… Such women were considered living libraries and were highly valued”. (From “Neerihinjik; We travelled From Place to Place. The Gwich’in Stories of Johnny & Sarah Frank” 2001). I imagine when I close my eyes and dream that we have always travelled with our disabled community as we crossed landscapes as vast as African savannahs, as wild as Alaskan river valleys, or as rugged as the Arctic Tundra. 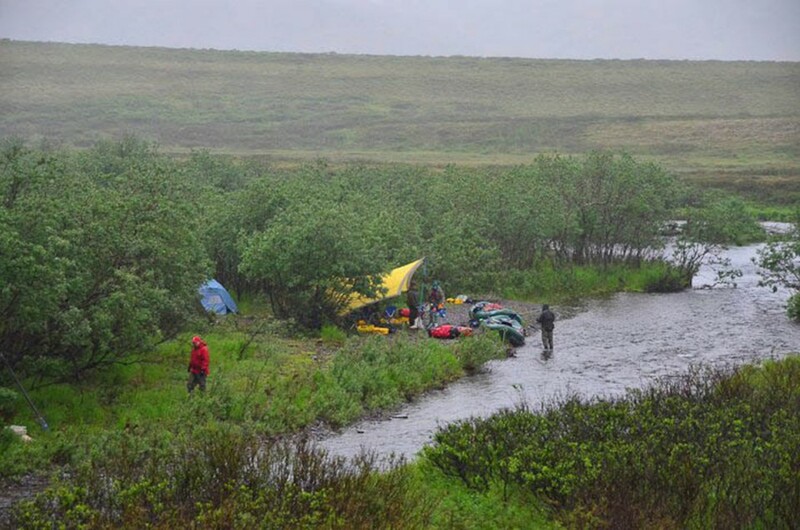 From the log: “Camp set up for a storm. Rafts set up as windbreaks. A cairn is set up to gauge the rising water level. Just the basics tonight, pasta, pesto, salad and everyone zipped in to tents by midnight. The end of a difficult day of travel in the dim, but never quite dark, and stormy night. 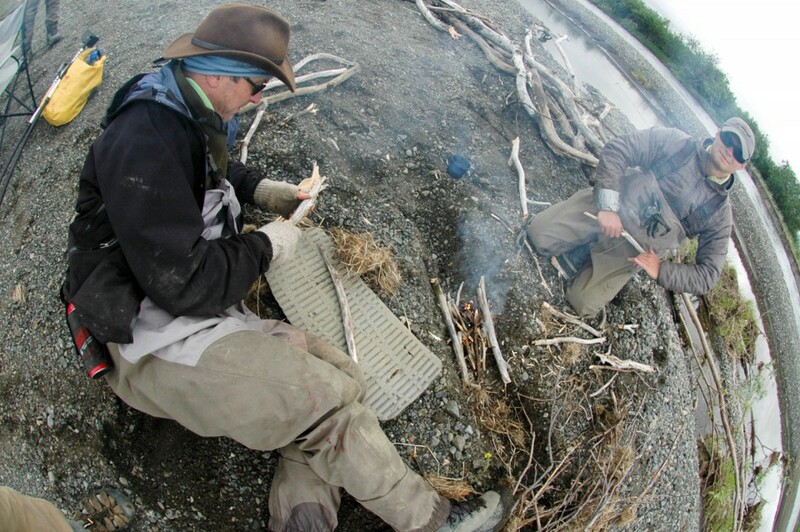 Olly Merrill on right and Mike Baxter kindle the evening fire. Olly organized us into teams for fire starting, tent set up, and to deploy the wing. The way Mike tells it: “The first day that I was in Malcolm’s boat, he was telling me that even a poor cast should be in play, “Reel it in like it’s your best cast”. A moment later, I had an extra loop of line hanging out of the spinning reel… I fed out a bunch of line to clear the loop, and when I began to retrieve, fish on! … It was our first sushi dinner!” Note that chef Mike had thoughtfully brought Wasabi. We had packed Nori and rice. A bit of Sri Racha and a salad rounded out the meal. 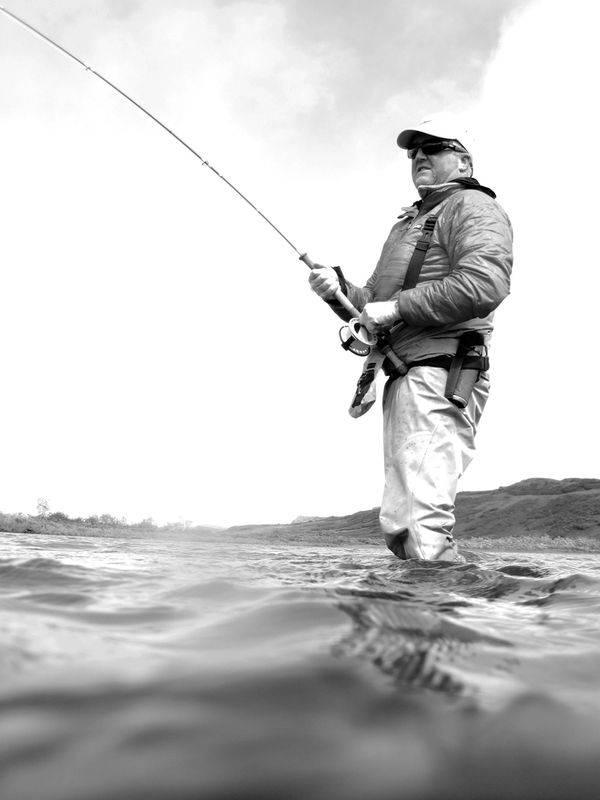 As the days passed Mike put down the spinning rod, learned to cast a fly and once he mastered the fly he never looked back. 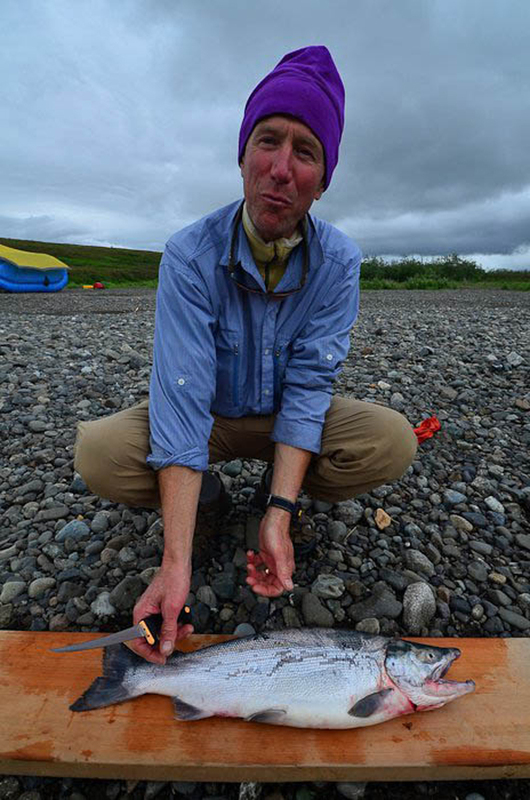 He caught and released 3 species of Salmon, Rainbow Trout, and Arctic Grayling on the fly. 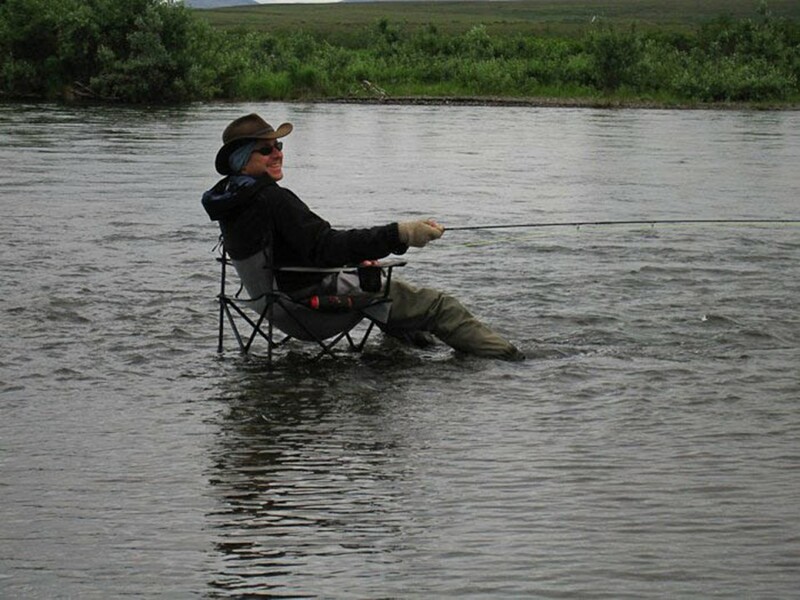 His first week ever fly-fishing. 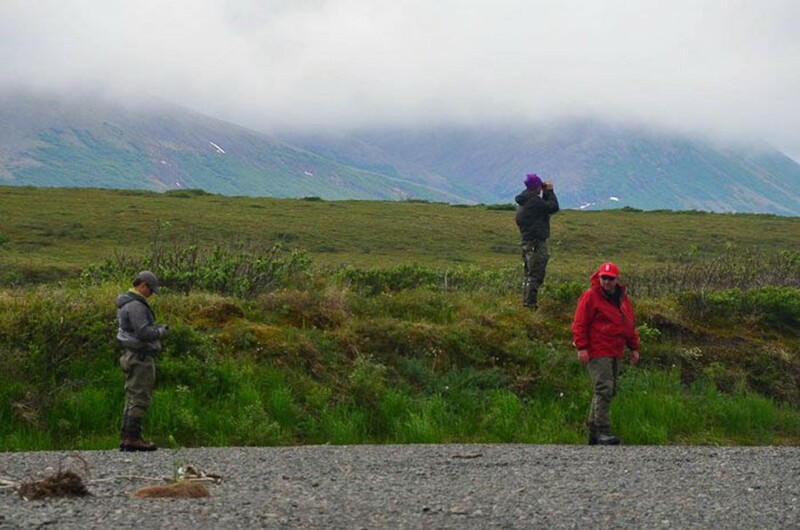 For three days we travelled through the Togiak Refuge designated Wilderness and didn’t see sign that another human had yet passed down the river in 2011. No aircraft overhead and no people tracks on the gravel bars. Each day we learned through experience what our strengths and weakness were and how to share the solitude while making new friends. 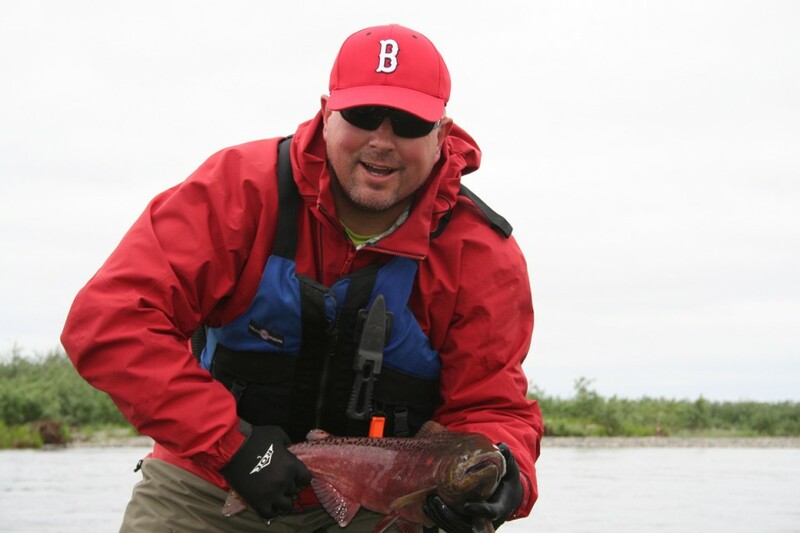 As it eventually does the Bristol Bay weather pattern turned fair, the rains eased and the fishing picked up as nutrients “bio-accumulate” in the lower river. Each mile got better. From the log: I noted one of the most remarkable hours in my Alaska fly-fishing experience. 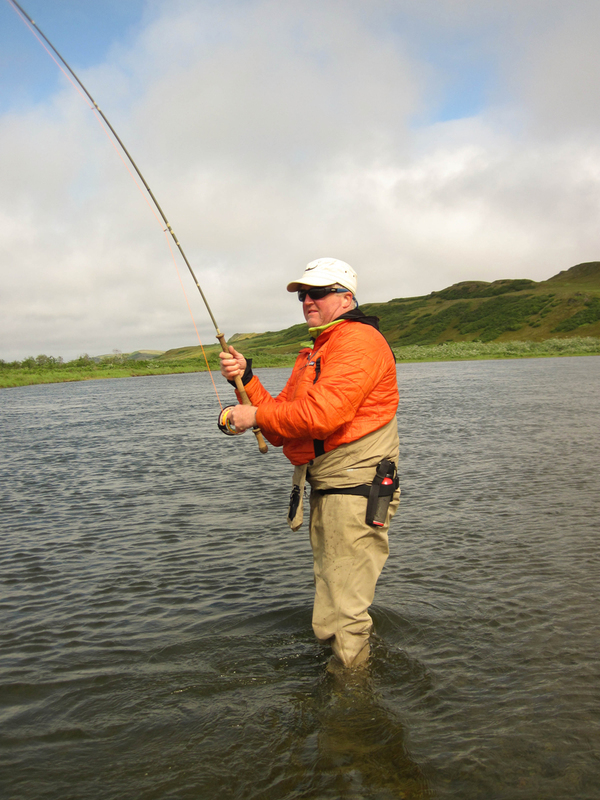 It was when fly fishing novice Mike “put it all together” with a fly rod. 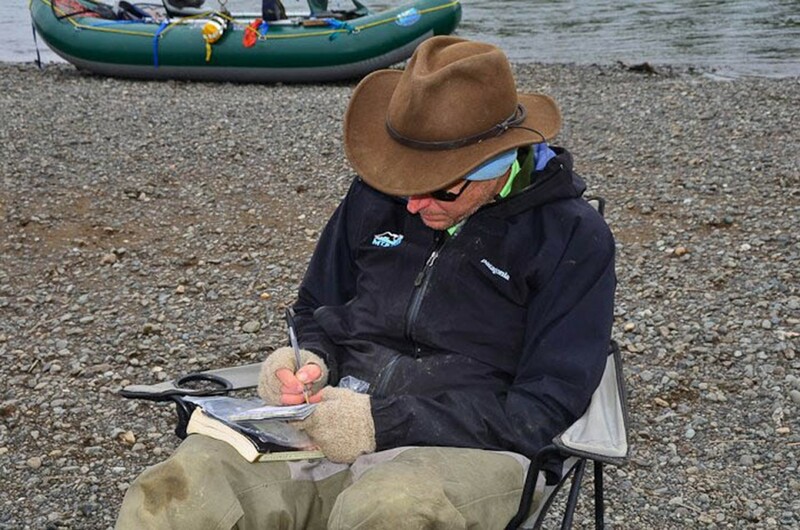 He was seated in the bow at mid morning working some fly line out on a 5-weight rod when up rocketed a wild Rainbow trout with his fly the corner of his jaw. 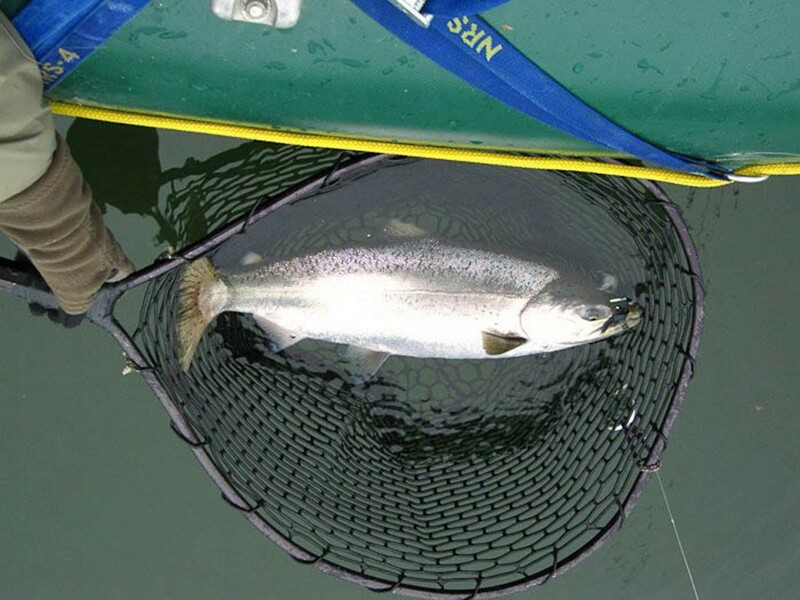 In Mikes words: “A short time later, Mark and I saw the spotted back of a huge king salmon as it took my fly just in front of the raft. I fought that fish for at least thirty minutes. Mark … coaching me to protect my knuckles by cupping the reel with my palm as the fish ran… Mark was rowing our raft to keep me facing the fish at the right distance and avoiding obstructions in the river. The other two boats beached, Malcolm took photographs and Ollie got ready with a net. 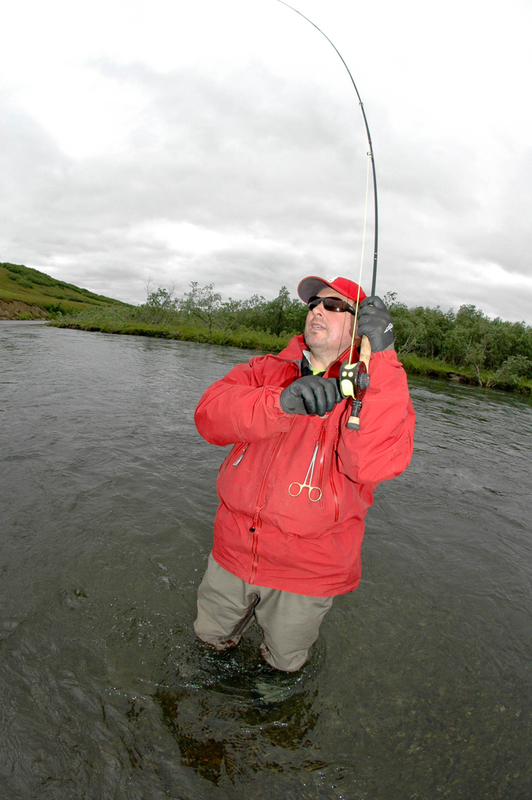 Eventually we got hold of the beast, freed the hook from its’ mouth, took a picture, and let it go.” It was great to watch as hour after hour Mike’s competence grew with the fly rod. From the log of July 13, night 6: “Mew Gulls and Arctic Terns shrieking as they dip their bill for caddis flies from the surface film of the river.” What we were seeing was that the same emerging aquatic insects, the caddis, mayflies, midges, and stoneflies so important to resident char, trout, and grayling were similarly vital for sustenance and nesting success to migratory birds. Arctic Terns, Tree Swallows, Bank Swallows, plus myriad warblers, sparrows, and thrushes depended on these most ephemeral of creatures. 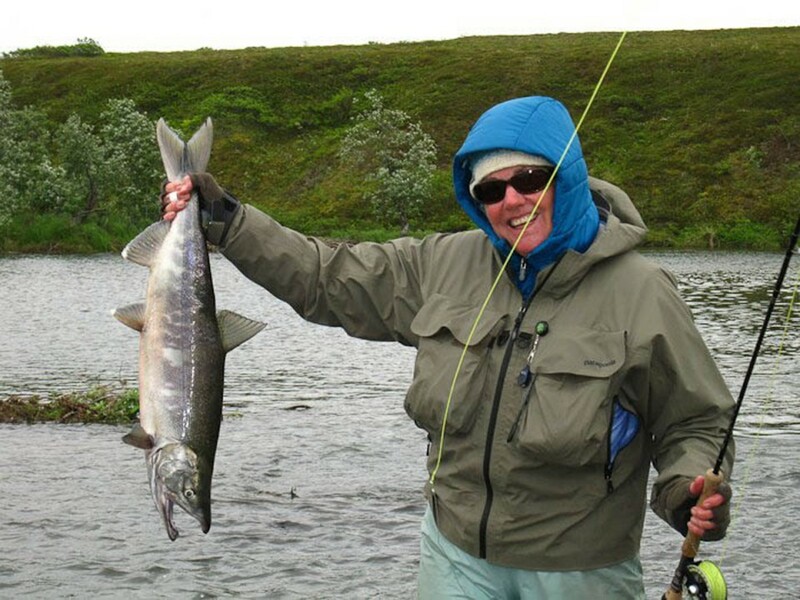 July 14, 2011: “Karen hooked and fought the largest King I’ve ever seen hooked on a fly rod this afternoon. It was in excess of forty pounds and when it broached it took your breath away”. 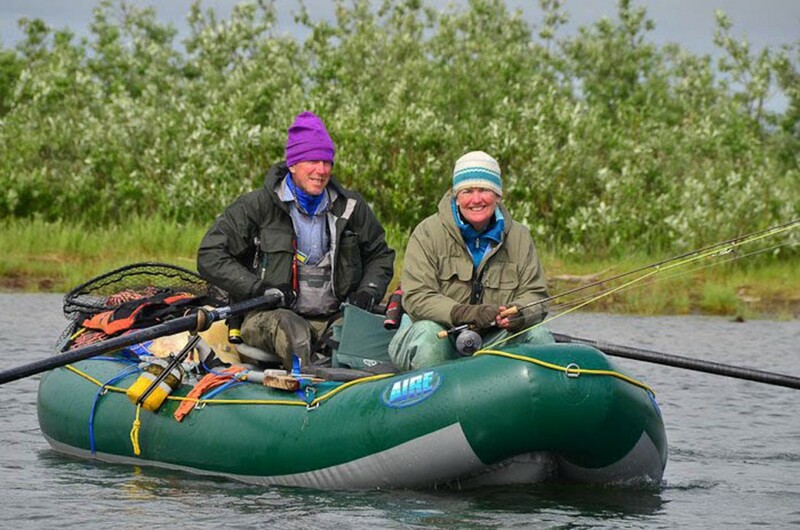 This Middle Fork trip is Karen’s second expeditionary trip in support of Paradox Sports participants to Alaska. 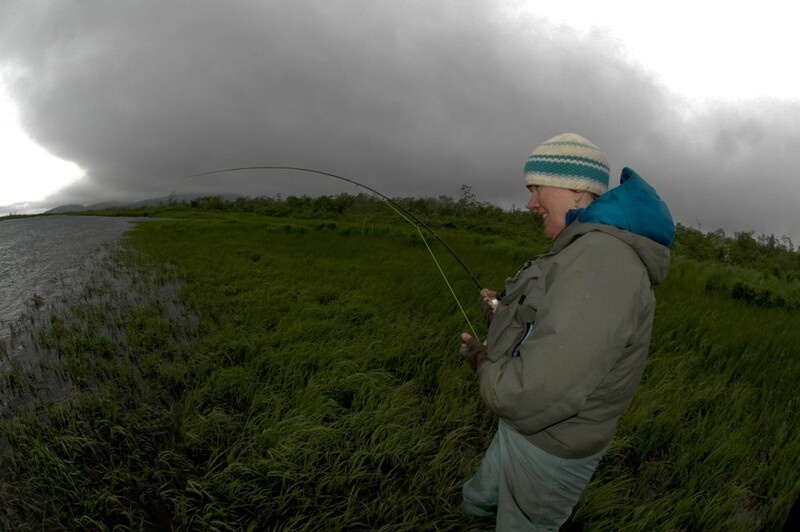 She is an intermediate level fly caster with a passion for angling and determination to persevere with a smile. Karen’s salmon was fine and bright and strong. She set the hook on something big in mid channel while swinging a bunny strip leech deep on her 6-weight rod. The 3 rafts pulled over to a grass bank where she could stand and position herself. Time passed and Karen agonized. She chased the fish downstream as far as footing allowed and then took a stand. She smiled still. Her knuckles sustained damage. Her arms were cramping from retrieving line as the King made run after run. She retrieved the leader to the rod tip 3 times and we could see the beast just 4 feet from the bank. And then the leader broke. She would have liked to touch that fish…. In the lower river Malcolm Daly could be more relaxed. The weather had moderated. His people, the Paradox Sports participants, were near the floatplane pickup and would all safely return home. He fished more and rowed less. 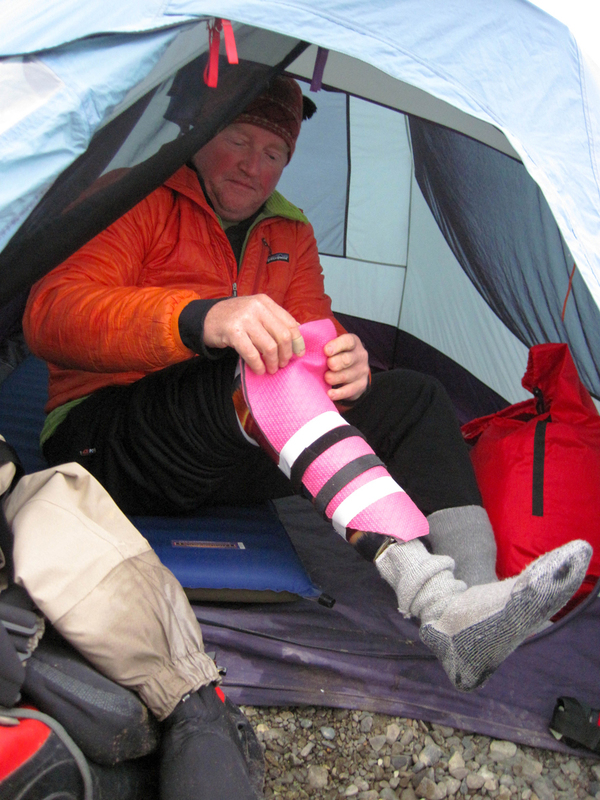 He adjusted his prosthetic leg for better comfort where it was creating a hot spot. Malcolm wades well. One wouldn’t know that he has a prosthetic leg, but then he’s been doing this for a long time. Malcolm Daly’s leadership and encouragement of members of the disabled outdoors community are becoming legendary. You won’t go wrong joining him on an adventure in the coming weeks, months, or years. See you there! Each year we learn more. In the culinary department kudos to Mike for bringing Pesto in a tube. The tube Pesto brand is ‘Amore’. 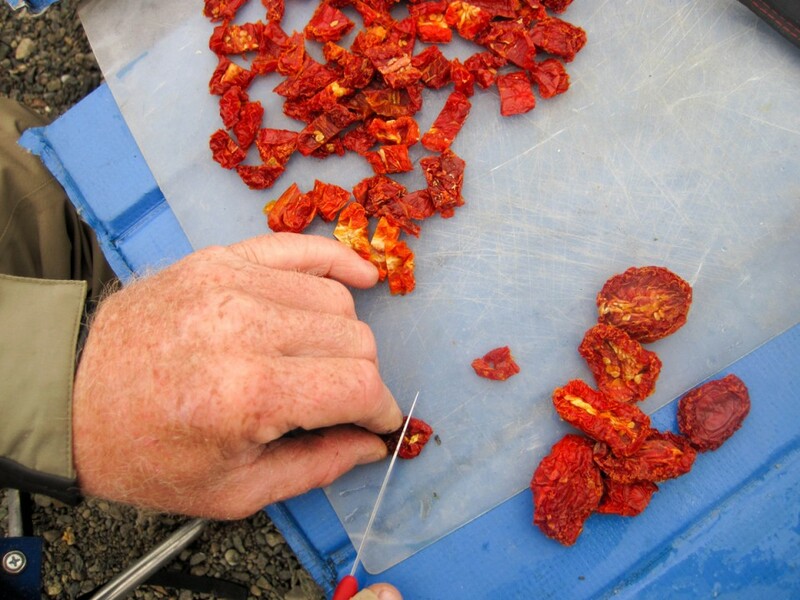 Also he brought sun-dried tomatoes, tabouli, and wasabi, all of which were put to good use in the kitchen. One change we’ll look at in 2012 thanks to Malcolm’s suggestion is increasing the protein in the Paradox expeditionary breakfasts. There is no doubt that great food is essential for self-propelled sports! The balancing act we are trying to perfect is how to balance the weight budget when various devices like wheelchairs or specially adapted boat seats need to be included. It remains a “work in progress”. Gear note: A folding camp chair which took tremendous abuse on the trip and kept working perfectly was made by “Travel Chair”. For Mike who didn’t have a wheelchair and needed a very sturdy chair for various transfers it was terrific. Finally two last techniques that Malcolm Daly contributed to the camp lore. First, when starting the camp fire in damp weather use the raft pump as a bellows. 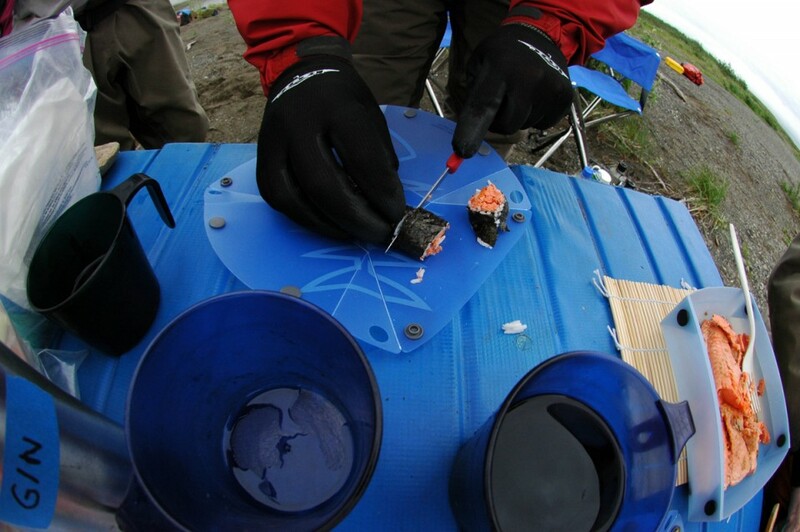 Second consider how you pack your dry bag? In particular which option you choose to pack the thermarest? Do you roll it tight? Do you compress it and fold it or just stuff it? From Malcolm: “Try the rock climber’s ‘haul bag’ style. Compress all the air out and close the valve then stand it in the bottom of the empty dry bag loosely rolled and let it expand to press outward against the outside of the bag. You will have a nice round, hollow tube left in the middle of the dry bag for items, which will be padded, from the abuses of travel by the thermarest wrapper around the outside. ** Malcolm Daly is a founding member of Paradox Sports. www.paradoxsports.org. Paradox Sports is a 501(c) (3) organization whose mission is: “Providing inspiration, opportunities, and the adaptive equipment needed to participate in human powered outdoor sports”. 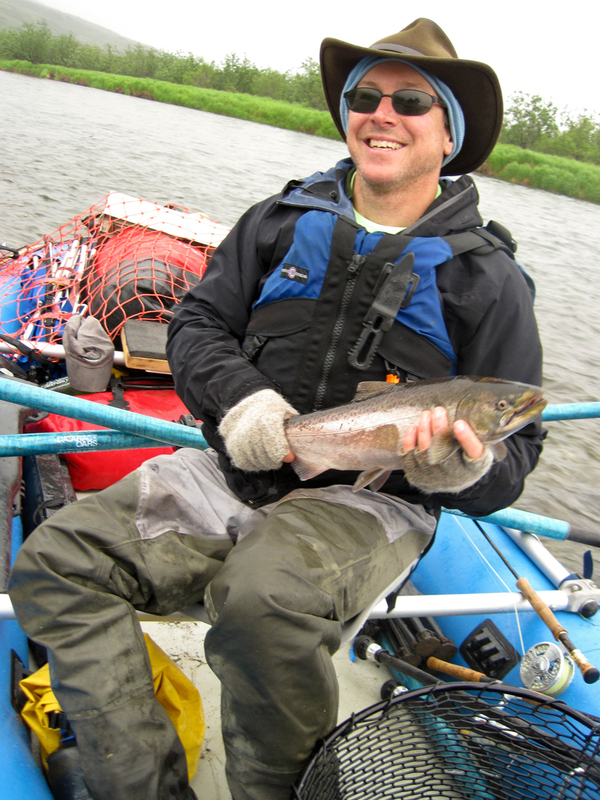 He is an avid rock and ice climber, rafter, fly fisherman, and a father. Charitable donations to Paradox Sports paid the expenses of the disabled participants.